Spring Awakening! Aquarius, Your April 2019 Horoscope Is Here! Lets look at the month ahead, Aquarius! Embrace the major shifts that present themselves, Aquarius! For you, these rumblings and transformations occur in the subconscious realms of rest, surrender, spiritual awakening, dreams and transitions. You might be experiencing shifts around how you process the deeper matters life presents, or maybe you’re eradicating bad habits of a lifetime. Bear in mind that these are long-term developments, not simply confined to April in particular. January’s new moon eclipse in Capricorn and the past two years of Saturn in Capricorn have already touched upon these themes, and the responsible approach you’re now taking in this elusive domain. Depending on the seeds you’ve sown – the efforts you’ve made around your inner world and what you’re prepared to let go of – you may now encounter notable developments and relief; be willing to accept what arrives in its entirety. On the 2nd and 3rd of April the moon will join Venus, Mercury and Neptune in Pisces, and the area of your horoscope governing your income, finances, your material world and your sense of confidence around earnings and your role. Mercury (now direct in this intuitive, seamless and compassionate realm of Pisces) will be in Neptune’s arms, making it an ideal weekend for going inward to reflect on the work you do to earn and feel good and your practical purpose. Bring acknowledgements and realisations about your position full circle. The New Moon in Aries arrives on the 5th April (at 8.50 am GMT) at 15º of the sign. This is a moment to renew your enthusiasm for communication, your skills in speaking up and your place among close colleagues, siblings and your inner circle. This includes your school friends, and the way you learn among local peers and relate to your immediate environment. 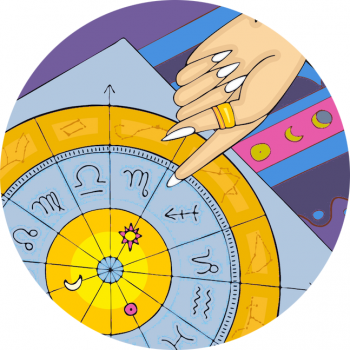 Being a new moon you can claim a fresh start for your closest ties, however you might not want to wholeheartedly lavish enthusiasm on these connections. Sun and moon are in tension at this lunation, as planets gathered in your secretive zone of detox and surrender create discord in the skies. You may need to strike a balance between solitary pursuits and mingling among your those around you. Sunday April 7th has the potential to deliver clarity, as Mercury and one of your rulers, stoic Saturn align, bringing together practical objectives and your position and syncs these with transitions you’re making in private. You could gain a sense of realism about what needs to shift for your job to fall into place. Consider how your everyday efforts and earnings compare with your spiritual axiom, and the key factors that enable you to feel able to advance professionally. Perhaps it’s your health, wellness and habits that are key, indicating you’re wise to maintain a sense of consistency and look after yourself to be at your optimum potential to accomplish what you’d like – and earn what you desire. We’ve an interesting day Wednesday April 10th, as the bold, sociable sun in Aries comes into tension with responsible Saturn; you may want to engage and enjoy yourself among friends but go steady and anticipate some kind of block that prompts you to slow your roll, Aqua. At the same time, Venus, Neptune and Mercury in your work zone will align with your private, solitary agenda, inviting you to acknowledge how your efforts are enabling progress. You’ll likely want to balance being present in an engaging setting with honouring what’s shifting behind the scenes for you. It’s on this day, too, that Jupiter begins its retrograde, which presses pause on growth in your social network, company setting or wider friendship circles (including overseas connections), an area which has experienced growth since November 2018; soon after (on the 12th) Mercury clashes with Jupiter, and on the 15th Venus clashes with Jupiter. Two areas of life may be struggling against each other (i.e. your sociable side or and your professional demands), which has been the challenge for Jupiter since he entered Sagittarius back on November 8th. With planets in Pisces overwhelming his ability to flourish, it could be hard to embrace the full potential of Jupiter this year. Jupiter Retrograde offers a chance to think over your dreams in the wider world – including certain professional aims and networking objectives, and how they’ll continue to evolve. On the weekend of the 13th and 14th the sun experiences tension with Pluto signalling another power struggle (like the 10th), which could again be connected to changes you’re making in your health, spiritual development or ability to recharge in private. One promising aspect is that Venus is aligned with Pluto at this time, suggesting that some efforts made to date makes it easier to work through any tension. Use the lessons from this recent Mercury Retrograde about how you’re most effective in your role to overcome the intensity – perhaps you’ve realised your value in your position and can rise above the people in your circle that are most antagonising. Easter weekend begins with the second Full Moon in the zodiac sign Libra, Friday April 19th (11.12 am GMT). The moon peaks at 29º Libra, and could be a moment to acknowledge and appreciate an experience, project, venture or plan that means the world to you. It could also be a time of overseas connection, a day of fun to recognise what takes you outside yourself, Aqua! Relish what broadens your scope and go further, noting what you’ve learned over the past eighteen months. The sun then moves into Taurus, giving you a chance to focus on home life, and your foundations, including family notions and the ability to recharge in your surroundings. Try to clear your schedule a little, making space for more grounded pursuits that allow you to nest. As soon as the sun moves into the earthy sign of the Bull it will shine a light on Uranus, which is now at the early degrees of Taurus – remember, Uranus is your contemporary ruling planet, Aquarius, so it holds extra sway over you. Make note of the days between April 21st to the 24th for interesting developments around your domestic life, as some innovations or revelations may be pertinent for you. The On Sunday April 21st Venus moves into Aries, signalling an excellent time to improve your personal relations and ties to close community; have fun among friends that have been so prevalent throughout the month! It’s a busy time for socialising yet try to indulge in activities that involve your home turf. Motivator Mars enters Gemini on the 31st March, and spends April moving swiftly through your playful, upbeat zone of fun and creativity! Note you could be raring to go, and feeling amorous, aside from one day. On April 27th, Mars will clash with Neptune in Pisces in your work zone, so that while part of you is keen to blaze a trail and enjoy yourself, another side might be keeping professional objectives in check.